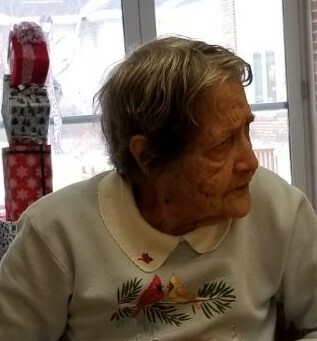 Carmen Lorene Goben passed away Nov. 18th at Southern Hills Spec. Care in Osceola. Services will be held Saturday, November 24th 2018 at Fieldings Funeral Home. Interment will follow at Goshen cemetery south of Lucas. Carmen Lorene Gwinn was born on Nov. 4th 1923 in the edge of Stephens State Forest. She was the youngest child of Chasty Cyril and Lula Florence (Benge) Gwinn. She attended the White Oak Country school where she graduated from the 8th grade. She loved school and had fond memories of her years spent there. She regretted not getting to go on to high school. On Aug 28th 1940 at the young age of 16 she was united in marriage to Floyd (Bunker) Goben. To this union 4 children were born, Aulden Allen, Connie Lou, Chasty Floyd, and Esther Lorene. Carmen lived all of her life in Lucas and Clarke counties. As a young wife and mother she worked extremely hard to care for her family. She loved the outdoors and was happiest when she could take her axe and saw and go to the timber or work in her garden. If you stopped at her house you better be hungry because she loved feeding people. She didn’t like to go many places unless it involved playing or listening to music. She was an accomplished keyboard player and played many times at the Purdy Jam. She was a very good cook also and her noodles were loved by all her grandkids and some of them called her “Granny noodle”. Preceding Carmen in death was her husband Floyd (Bunker) parents Chat and Lula Gwinn, a cherished Grandson T.A. Masters, an infant granddaughter Jaime Lou New, a daughter-in law Pat Goben, her sisters Bessie Mundell, Florence D’attilio, Gladys Williams, Myrtle Danner, and her brother Lester Gwinn. She is survived by her children Al (Nancy) Goben Osceola, Connie Moore Russell, Butch (Kayla) Goben Lacona and Esther Harlan Russell, numerous grandchildren, Great grandchildren, nieces and nephews, neighbors and friends. She will be missed by all who knew and loved her.